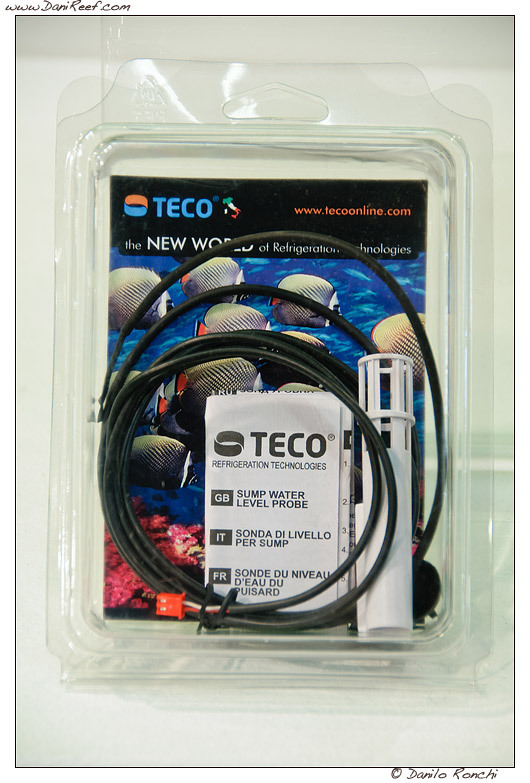 The Teco-Chill is a complete system to lower the temperature in aquarium, developed by italian company Teco, and on the market since last summer. We have had a world premiere, we made a video explaining the installation and use, and after a whole summer full of tests and trials we are here for a complete and in depth review. 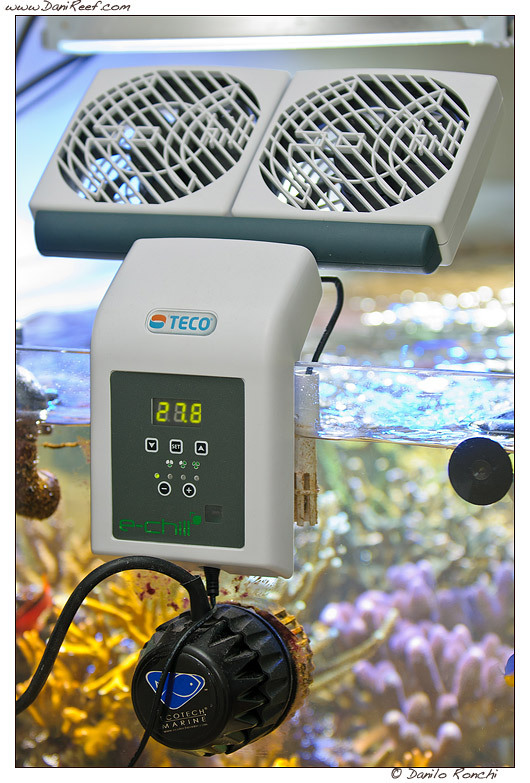 The Teco gave me the version with 2 fans that think the more balanced and less invasive for an aquarium like mine measuring 130x60x50(h) cm. 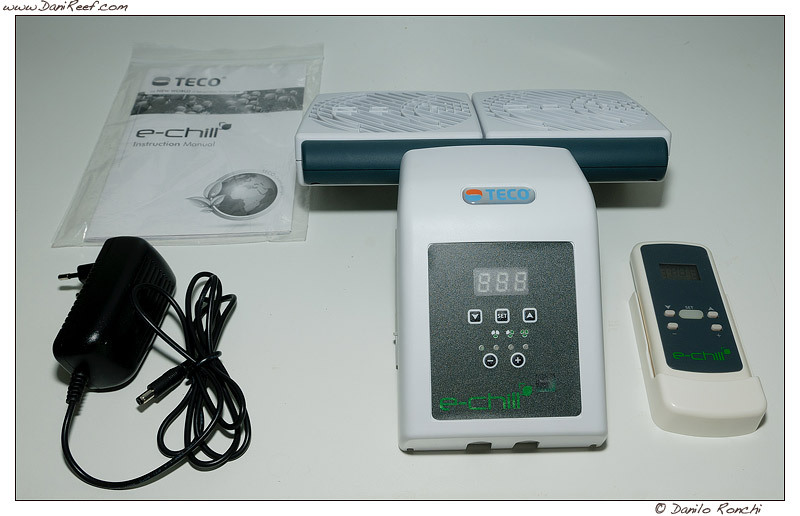 The E-Chill is composed of a control part and a cooling part. The part relating to cooling consists of a block which can accommodate from one to three fans from about 12 cm in diameter, to allow us to choose the most suitable object. 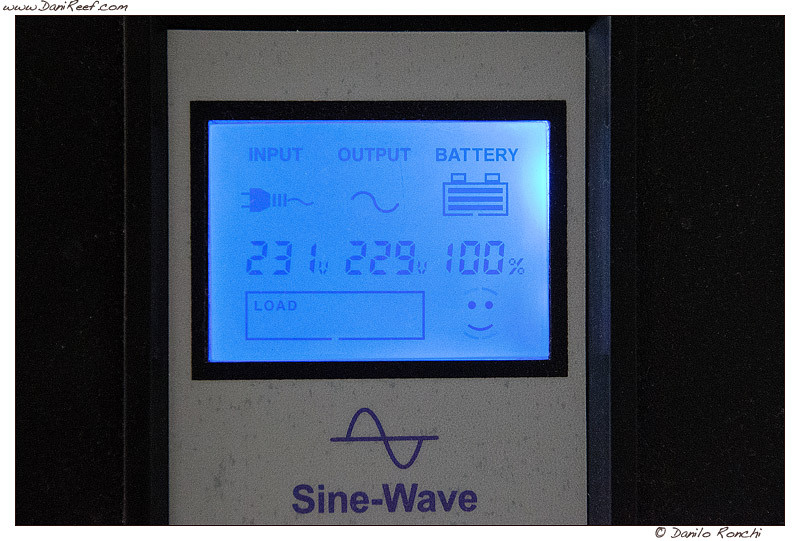 The dimensions are 260x220x200 (h) cm with a weight of 750 grams and 12V transformer. 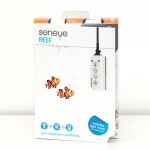 The electronic part includes a thermostat that is responsible for turning on and off the fans and to vary their intensity over three levels, and is connected to a level sensor that can interact and completely switch off the E-chill to avoid excessive evaporation from aquarium. The probes present are in fact two, level and temperature. 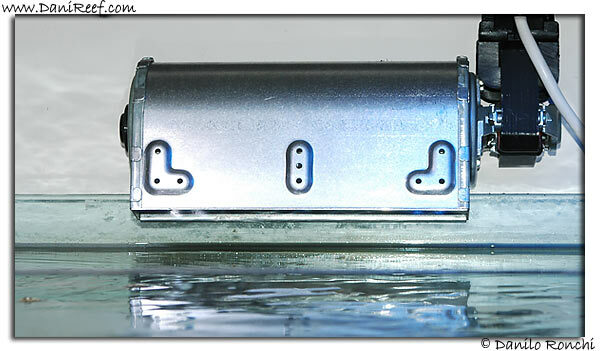 They are located at the sides of the glass attachment clip, in the following picture we can notice the two cylindrical containers, removable, which are in contact with the water and that within host the two probes. Probes that in reality are nothing but those two cables blacks that you see in the picture. The build quality is impeccable, with fantastic pair of plastic. 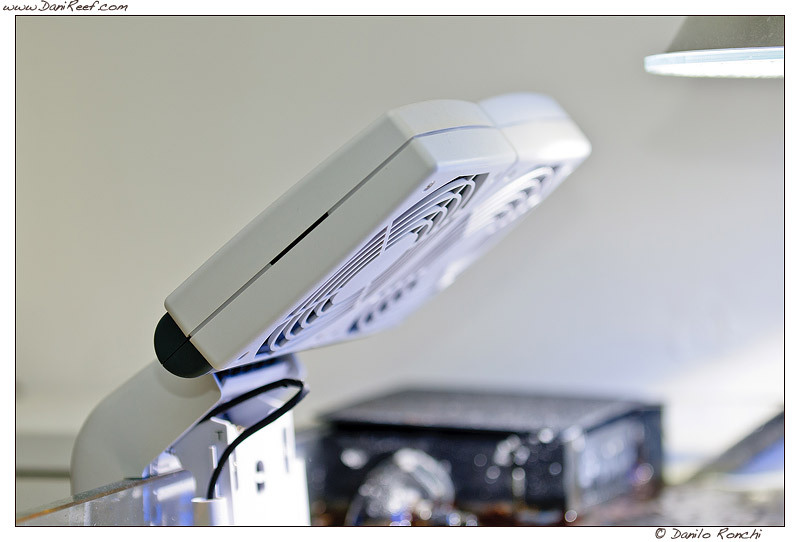 The E-Chill is beautiful to see, especially when compared with alternative solutions such as tangential fans. 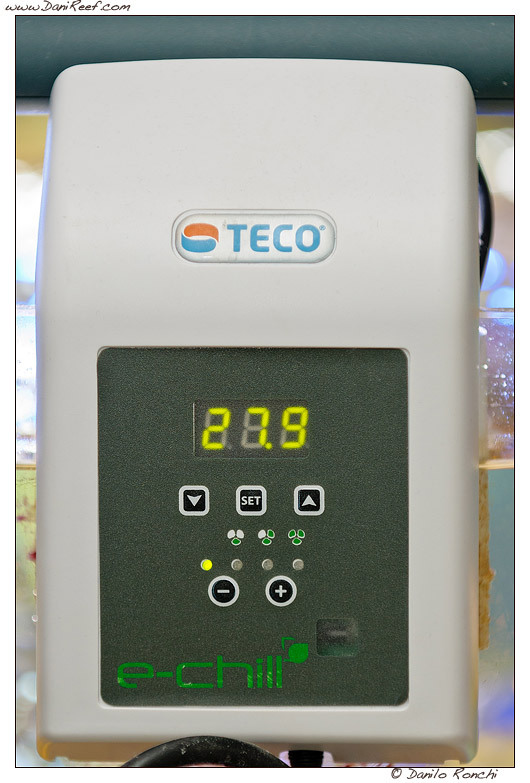 The Teco suggests the use of E-Chill, who they calls aquarium energy-saver, associated with a chiller, to obtain the best synergy from two systems. As we know the fans act by favoring evaporation and thus lowering the temperature in the aquarium. In fact, water lapped by air flow, uses energy to pass from the liquid state to the gaseous state, and the energy used in practice is provided at the expense of heat. The greater the evaporation, the greater the loss of temperature. 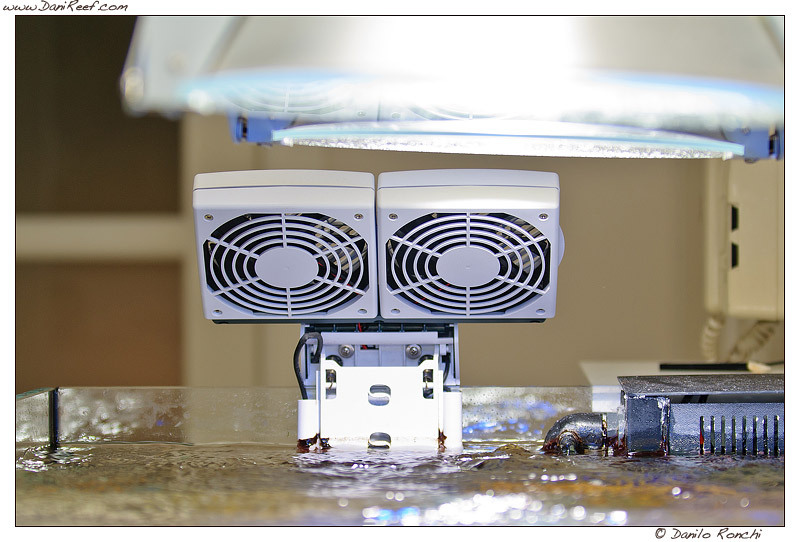 The fans must create a flow, to facilitate evaporation, on water surface, oriented between 45 and 60 degrees approximately. 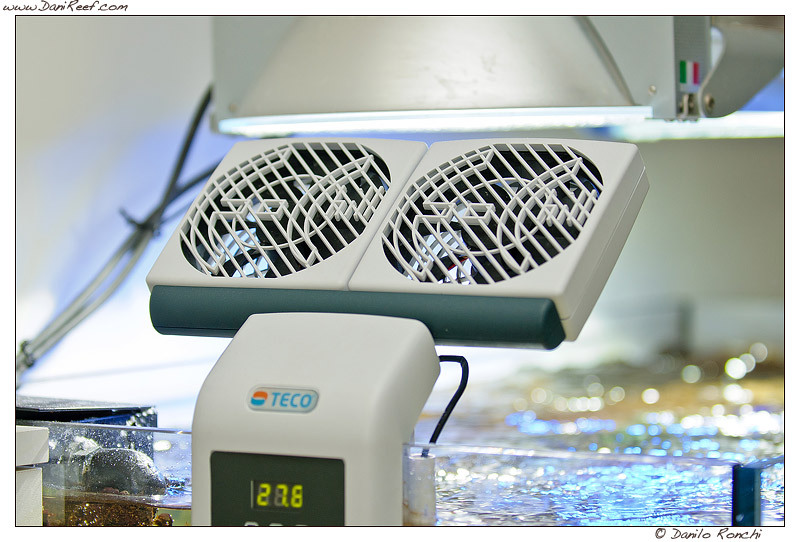 The use of fans in the aquarium has two major limitations, and Teco Echill has no exception. The first is that the temperature in the tank can never be much lower than the ambient temperature, and the second that the speed of lowering of temperature itself will strictly depend on the humidity. 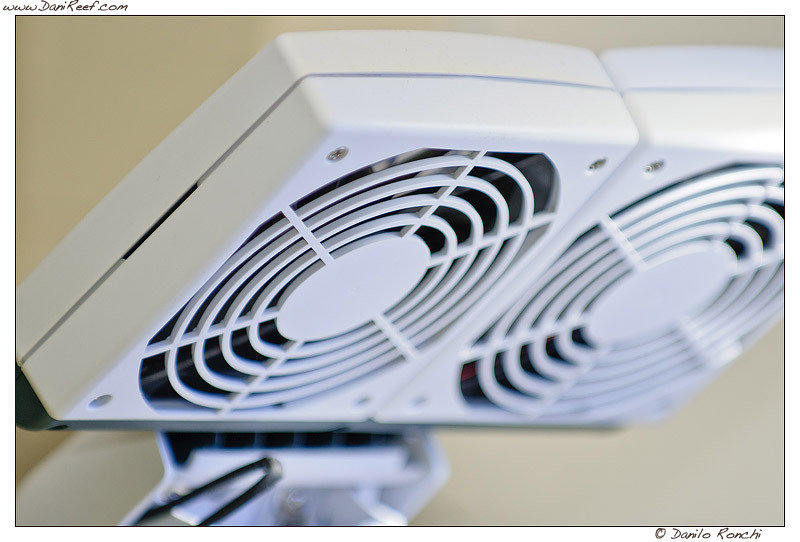 On days of high humidity the functionality of E-Chill will tend to a minimum. The synergy with the chiller can overcome these problems by allowing us to always get the best of both worlds. Under normal conditions Echill works with an extremely limited energy consumption, but in extreme cases, the chiller quickly restoring the set temperature. In my experience last summer in Rimini, Italy, with average temperatures above 30 degrees outside, night and day, for almost 3 months, I can say I used the E-Chill with incredible satisfaction because the chiller was turned off almost every day throughout the summer, apart from some peaks that have occurred in some particular week. The advantage in any case has been enormous since the lowest power consumption due to the use of E-Chill in place of the chiller, although at the expense of a greater noise. All, obviously, has led to a greater evaporation. We must then consider the simplicity of installation and ease of use. 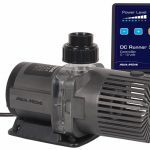 Without having to fiddle with pipes and pumps it is sufficient to take the E-chill, place over the aquarium glass, turn it on and set it up, if you want even by the supplied remote. And it is immediately ready to work at his best, saving us from the cost of keeping also a secondary pump for the chiller, at least before and and after the summer, since you can easily postpone the installation of the chiller. The remote has often aroused in those who have seen conflicting comments, often in fact was not understood, arguing that would be a useless accessory, but payed, when in fact we could act directly on the keypad on the back of the E-Chill. 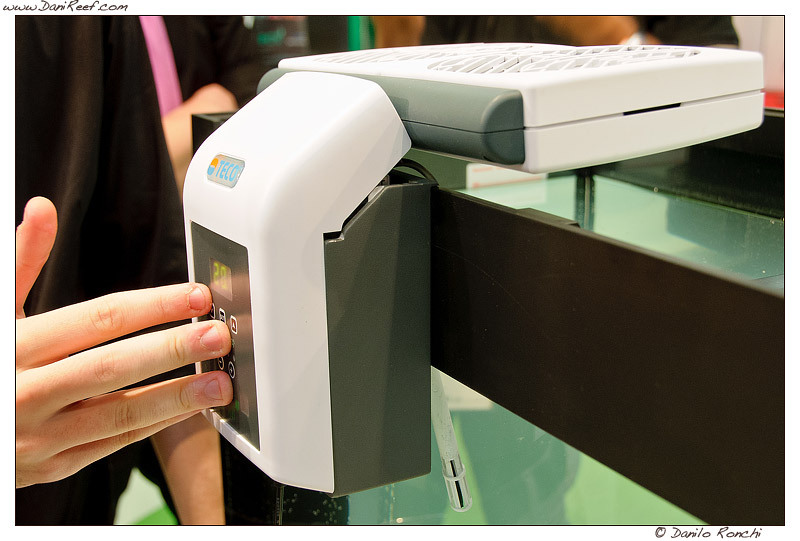 But this is precisely the point, the keypad is placed on the back of the E-Chill, looking at the aquarium, as you can see from the photos, but not everyone has the ability to mount it on sight. Often you will have to mount toward the back wall, or to a side wall, where it is literally impossible to go to type anything. In this context, the remote becomes what is usually called a killer app, that is something that allows you to take home the result of the competition. 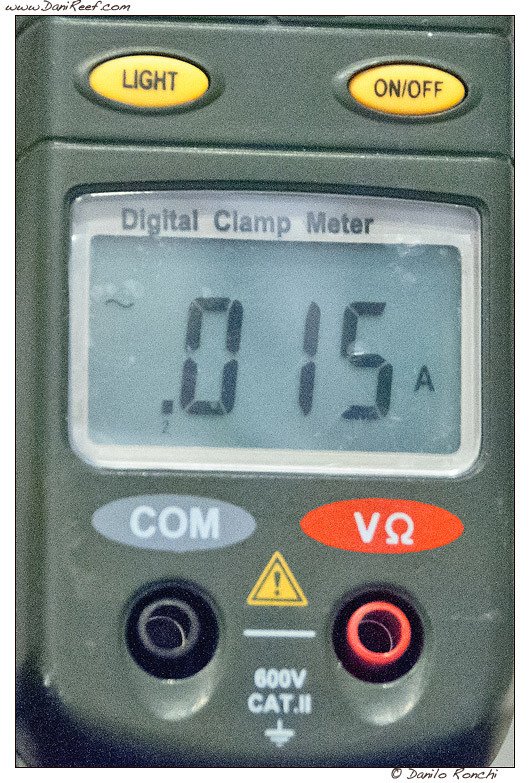 The control panel shows constantly, in a yellow character LCD display, the aquarium temperature with an accuracy of 0.1 to degrees. 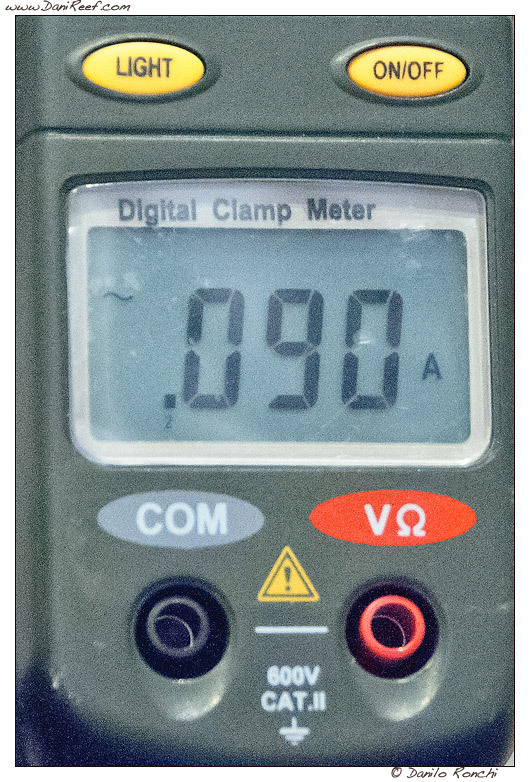 Pressing the SET key allows us to set the temperature we want to maintain in aquarium, with 0.1 degrees precision, as well explained in the initial video, while the plus and minus keys are also used to adjust the fan speed. The major limitations of E-Chill, unfortunately, are its construction and its fans, as it was conceived it can be successfully used only on tanks that have HQI lamps, that therefore do not cover the entire surface of the aquarium and they are kept fairly high on the water surface. While with T5 lamps, which are known to be kept closer to the surface of the water and which often take up the whole free surface, its use becomes much more problematic. With the LEDs instead, with different sizes that exist, it depends from case to case. For this reason, last year, during the Teco Open Day (The first Teco Open Day Reportage) held at the Aquarium of Cattolica, Italy, several users have made a specific request to Teco, and also have suggested a simple solution, namely the possibility to move back the fulcrum of rotation of the fans, bringing it lower, and thus maintaining the fans near the side of aquarium, so they can be used with any lighting system. Just during the Interzoo in Germany (Editorial: the Interzoo 2012 in Nuremberg and Interzoo 2012: The Teco booth) we saw the first prototype of this add-on that serves to distance the Echill from the edge of the aquarium and simultaneously lowering the fulcrum of the fans, to allow use with a larger number of lighting. During the show was presented another accessory we heard since the first appearance of Echill, a level probe to be positioned in the sump, so that the detected level was into the sump and not in acquarium. In this way we have the opportunity to abort the operation once the level drops below a certain level. 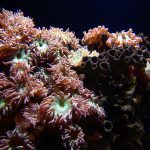 We can be alerted by an audible alarm so it’s possible to prevent excessive evaporation from the aquarium that could leave no water in the sump, with so many risk for our pumps. The Teco has also announced to release one new osmocontroller to connect directly to Echill, a development that we would be happy to see because the integration of objects that are made ideally for working together is extremely interesting, especially when the level of technical and construction is very high and the price is worth. As always with all the tools at our disposal, we have measured whichever we could, and then we have analyzed the results. First, we checked the incoming current, going to plug the Echill and tangential fan, taken for comparison, directly to my Zeus. 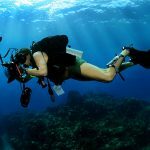 The Zeus is a UPS specifically designed for aquarium, now sadly no longer in production, but which you can read a review here Zeus by OceanLife – English Version, as I’ve said many times, I consider it an essential accessory. 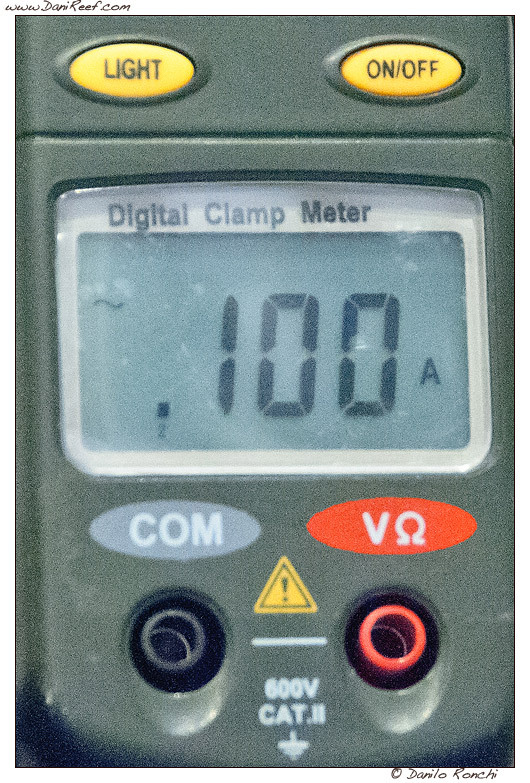 As we can see we have considered a current with a voltage of 229V. 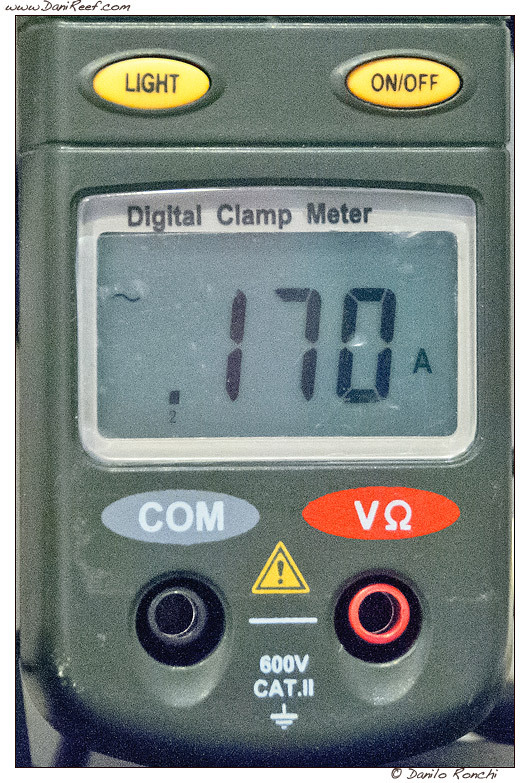 Then we turned off the muvements pumps and left on return pump, and we measured the level of noise with my sound level meter, a VOLTCRAFT 320, IEC 651 Digital Sound Level Meter Type II that for these measures is sufficiently reliable. 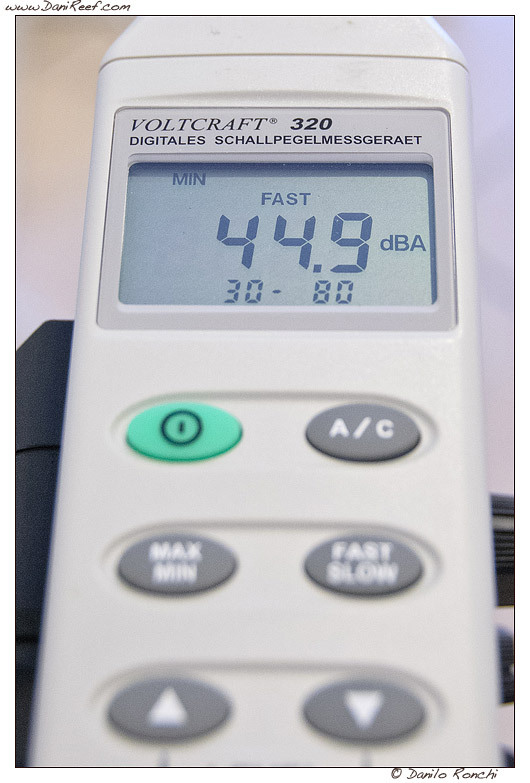 Given the nature of the noise to be measured, all measurements were performed with the attenuation curve dBA. 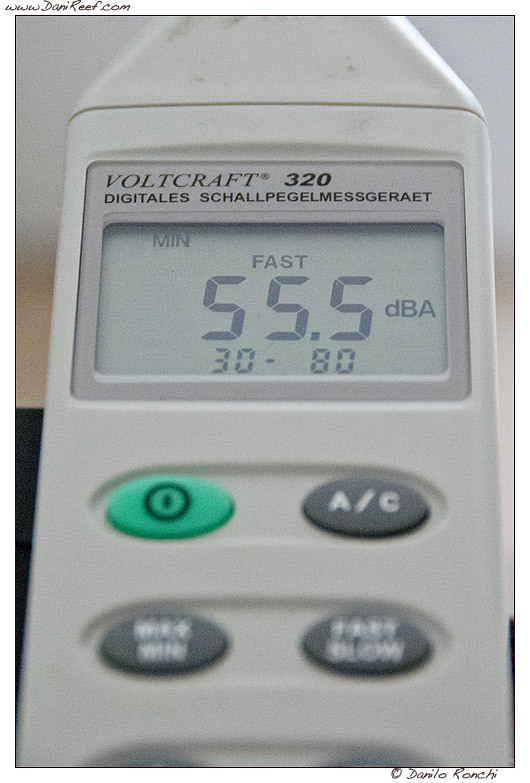 We measured ambient sound pressure level, or more commonly noise, equal to 38.6 dB. 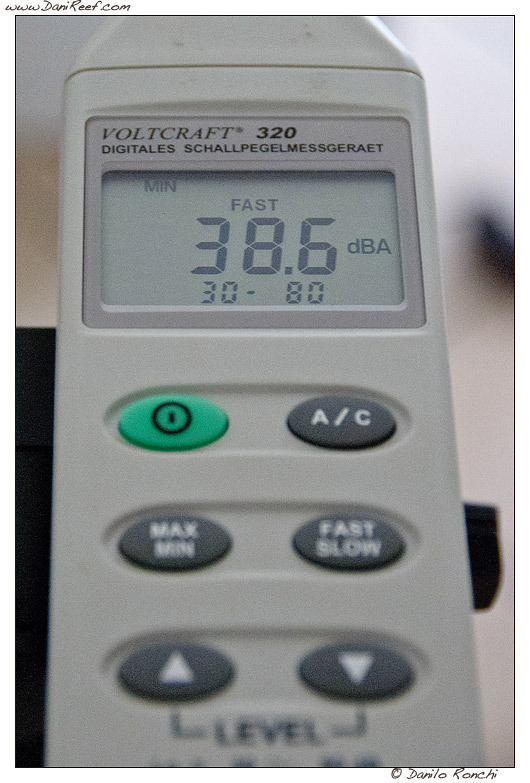 Then we proceeded to connect the Echill and to measure the intensity of noise at various fan speeds, remember that to be three. 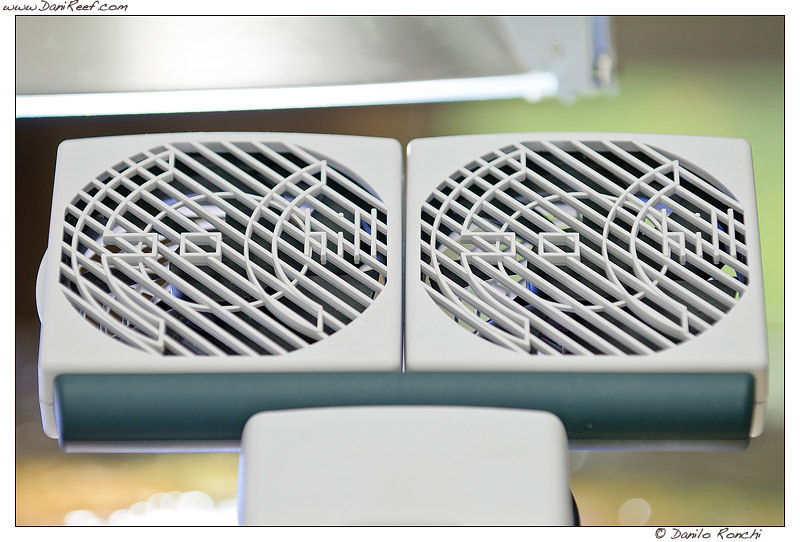 By comparing these values with those found on TR15 chiller (Chiller Teco TR15 – the complete review), we see that, only with the fans set on the two lower speeds, Echill is quieter than the chiller, in this configuration with dual fans, we remember that at a distance od one meter the chiller had record 53.8 dB. At higher speeds the fans have proved far more noisy. 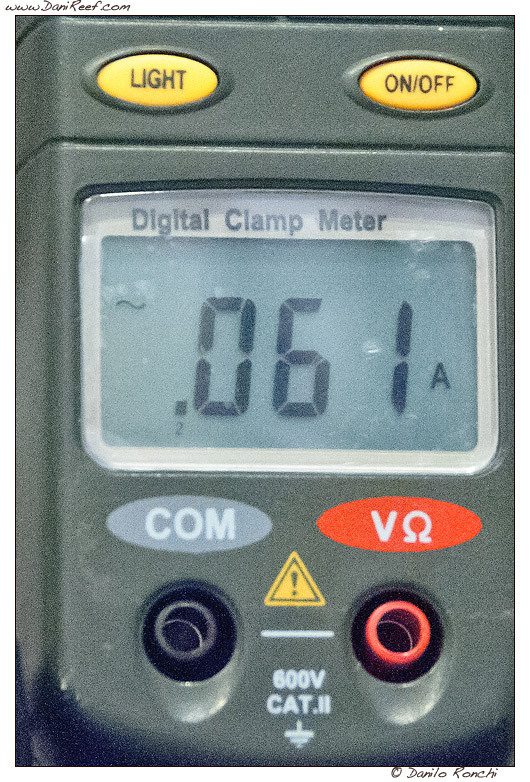 Given the type of test object we can accept a power factor of about 0.6, (the power factor is the phase shift between current and voltage in an AC circuit) that equalizes the consumption respectively to 2 watts, 8.4 watts , 12.36 watts and 13.76 watts, very close to 14 watts declared. The tangential fan operates at a single speed, and to work at best requires a computer for aquarium or a thermostat to avoid that stays on for too long and doing so cooling too much, or remaining switched on too little, being not sufficient to lower the temperature. 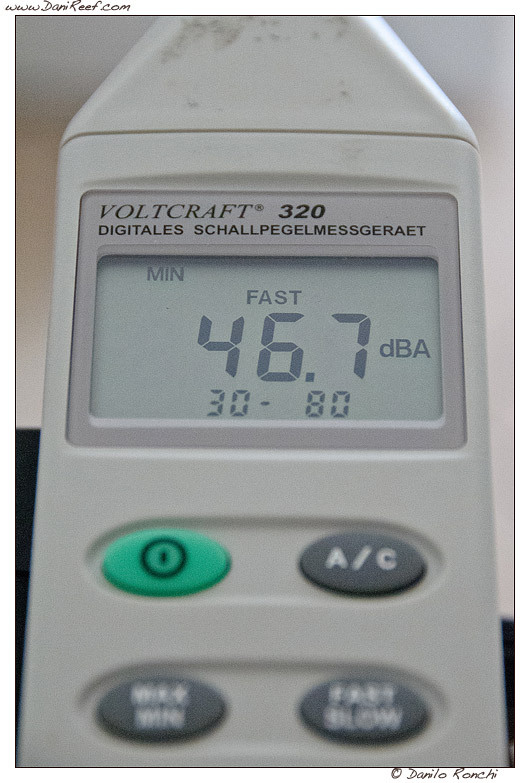 The sound pressure level is much lower than Echill with three fans running while power consumption is almost double, although also admitting an equalizing power factor of 0.6 we get a consumption of about 23.35 watts . 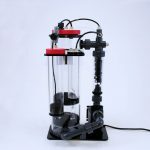 Although the real question becomes which of the two solutions is better for the aquarium, because the consumption is not so high. Since the consumption of Teco TR15 chiller, which we take as a yardstick, an hour of chiller operation (380 watts) gives us about 16 hours of operation of tangential fan or approximately 27.5 hours of operation at full power of Echill. Quite tangible difference. 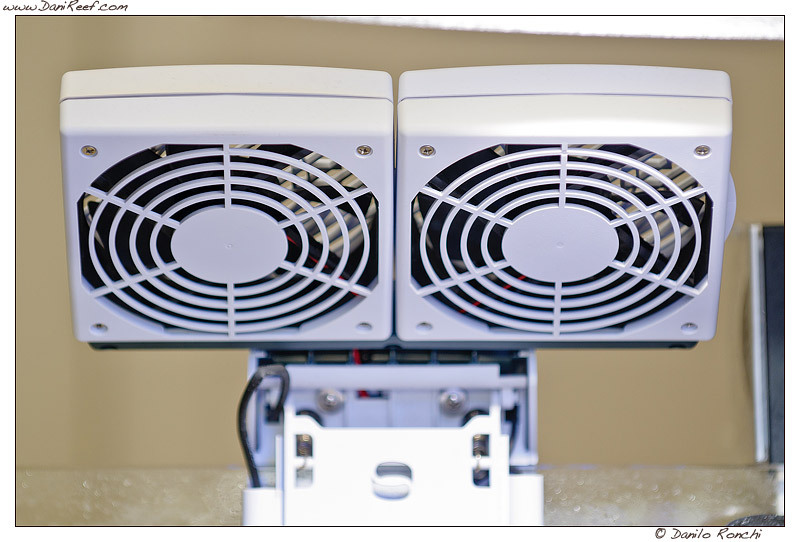 The tangential fan used for our tests was purchased from Rs-components and is given for an airflow of 120 cubic meters/hour, while Echill has 175 cubic meters/hour for every fan, so the Echill under test has a flow of 350 cubic meters/hour. So the Echill moves three times more air than tangential fan with almost half the power consumption! If we translate this into numbers the tangential fan has an efficiency of about 5 cubic meters per watt, while the Echill has an efficiency of 25 cubic meters per watt! Efficiency 5 times higher! The experience in daily use in my house with my tank and my lighting system hangs completely in favor of Echill, I never had, before now, the possibility to limit so much the use of chiller even when I used 3 different tangential fans side by side. Now do not mean to say that the Echill is better than three tangential fans, although the efficiency just measured give us such a little comfort, because it depends very much on environmental conditions, which in different years may not have been constant, but in any case the experience suggests to me that the comparison between a single tangential fan and the Echill is pitilessly in favor of Echill. Do not even take into account the PC fans because honestly I’ve never seen anything even comparable to the tangential fans that come here with broken bones in comparison. We love Teco Echill, and I think it is impossible not to notice. 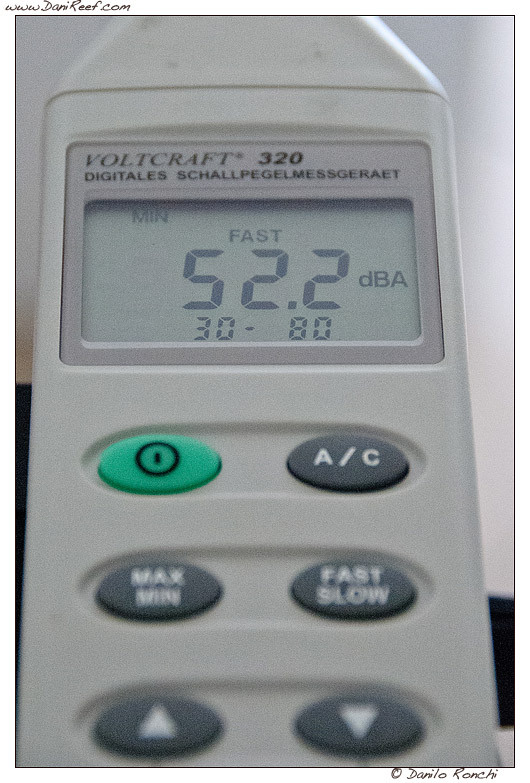 Given the not so high cost related to the overall technical content that is 180 euros for Echill1, 216 euros for Echill2 (the same of this test) and 265 euros for Echill3, and given the extremely low power consumption compared to a chiller, we can only advise the purchase with your eyes closed. They are extremely high performance, much more than a tangential fan while having alf consumption, are ready to use, are a complete solution and also expandable in the future, are extremely efficient, consuming very little, and the field test ended with a victory with flying colors. The downside is the noise, greater than that of a chiller, but we can adjust fans speed, so maybe you can afford to lower it when you’re home for a more comfortable “noise”, and the induced evaporation increases in a very substantial. 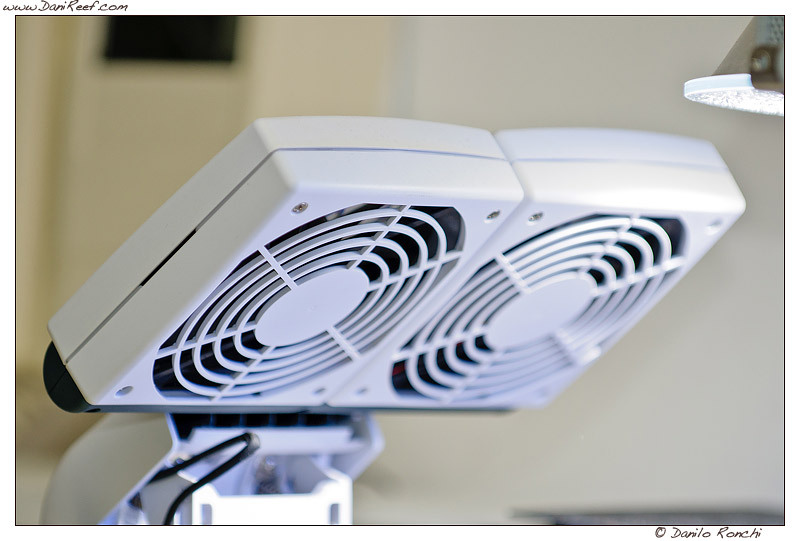 In any case, the purchase is more than recommended if you have a lighting system that allows! 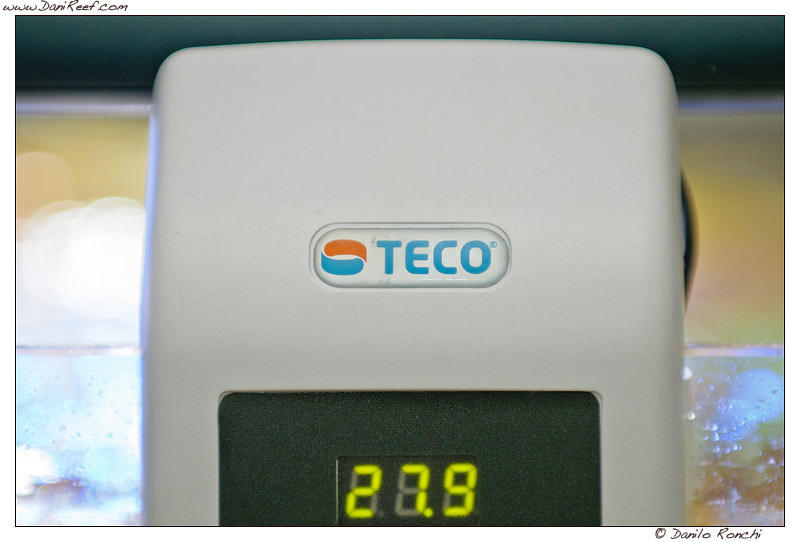 Many thanks to Teco for providing us the Echill object of this test.